Tamblingan Lake offers amazing view and tranquility of lake water which fused in the coolness of mountains atmosphere. The Lake became a witness to the richness tradition and culture of Bali. The natural view of this amazing lake has become a spectacular pre wedding photoshoot location in Bali. The Tamblingan Lake pre wedding location can look either moody or cheerful. Beautiful, sheltered, and full of cultural value which still preserved and stored tightly by The Caldera of Bedugul. Tamblingan is located in Pancasari Village, in the District of Banjar, Buleleng Regency, Bali. Visitor can access this place directly from Ngurah Rai International Airport, about 76 Kilometers (less than 3 hours). Let's take a closer look to the beautiful of Tamblingan Lake! The natural view makes this lake so compelling as a spectacular pre wedding photoshoot location in Bali. The Tamblingan Lake pre wedding location can look either moody or cheerful depending on the weather condition. Most couples do a photoshoot at this beautiful lake. They do this at the dawn to get the panoramic beauty of the sunrise and shrouded by mystical morning mist. To add a dramatic effect, couples can rent a boat. Photoshoot can be done a bit further to the middle from the lake edge. This location is very suitable for couples who love the mystery and a touch of little mystic. The theme of boats, waters, forest and fog became the mainstay of these pre wedding photoshoot location in Bali. There is also an interesting spot called Gubug Temple or Pura Gubug. The temple presence will add to the mystery and mystical impression on every shot. This quiet and mysteriously temple is situated on the west side. Besides being a place of photo shoot, the situation here is also very cool and soothing to rest. At the temple there are two shrines with roof overlapping called Meru. The first Meru was build and worshiped by Catur Desa (consist of: Munduk, Gobleg, Umajero and Gesing). Another Meru was venerated by devotees belonging to Subak members from Tabanan Regency. The Pujawali or offering ceremony on this temple is falls on the full moon of the fourth month in Balinese Calendar or Puranama Kapat (around September). The pujawali is carried out by the local resident of Tabanan, the Catur Desa, and cooperated with Tabanan Government and Buleleng Government. Rich in history and culture combined with an exotic view of Tamblingan Lake, blanketed by coolness mountain atmosphere, surounded by rainforest, mountain and the rim of Bedugul Caldera. Tamblingan Lake pre wedding is recommended for pre wedding photoshoot location in Bali. Located in the rim of Bedugul Caldera, Tamblingan area is influenced by Very Wet Region Climate (A type climate based on Schmidt-Ferguson climate classification maps) and the cool climate due to its location at an altitude of nearly 1.220 meters (4.000 ft) above sea level. Very Wet Region climate in this area has humid season which begin from October continues until June (9 months). Eventhough there's no rain, fog always blanketed this area. Due to this climate type has long rainy season there is always water source throughout the year. In addition, this area is close to the lake as the major water resource. The soil in this area is very fertile volcanic soils which derived from Volcanic of Lesong-Pohen-Sengayang Group and also from Old Buyan-Bratan Group Volcanics . The combination of water source, cool climate, and fertile vulkanic soil make this area most suitable for agriculture, vegetables and fruits plantation. 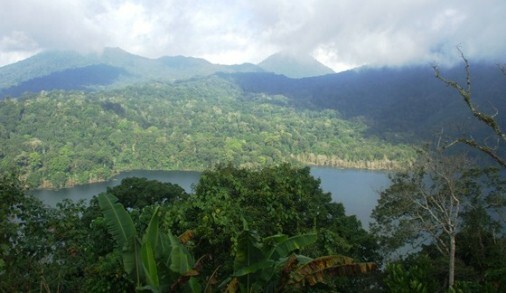 Tamblingan and Buyan Lake are included into The Nature Park (Taman Wisata Alam) Lake Buyan-Tamblingan and bordering with The Nature Reserve (Cagar Alam) of Batukaru. This area encompasses several villages namely Candikuning Village and Batunya Village (part of Tabanan Regency), Pancasari Village and Asah Munduk Village (part of Buleleng Regency). In April 1996, The TWA Lake Buyan-Tamblingan is determined an area of 1.336,50 hectares (based on the minister of forestry decision). 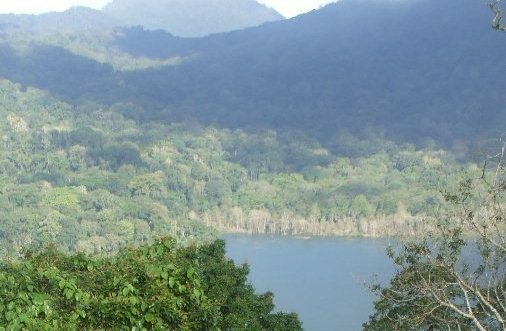 Then in January 1997 the area of TWA Lake Buyan-Tamblingan is revised into 1.703 hectares, including forest area and water area of the lake (based on the decision by the Bali Regional Department of Forestry). 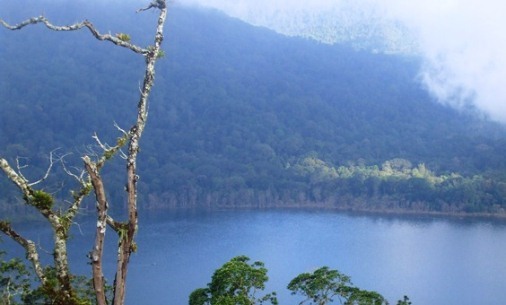 Visitors can enjoy the beautiful of Lake Tamblingan including Lake Buyan from Asah Gobleg. This place is located a bit high on the northern rim of Bedugul Caldera . Otherwise shrouded by fog, visitors can enjoy this beautiful twin lake surrounded by mountains, rainforest, cloves trees and vegetable agriculture land. Formerly, the settlements is located around of Mount Lesung. The name of Tamblingan comes from the words "Tamba" and "Elingang". Tamba means medicine and Elingang means remember or spiritual ability. Mentioned in the ancient manuscript, Lontar Kutara Kanda Dewa Purana Bangsul, that the plague or epidemic had hit the population around this location. Then the holy priest or hermit take a water from the lake as "tirta" or holy water, to treat the people which being affected by the plague. With prayer of worship to the God or Hyang Widhi and spiritual abilities of holy water, the plague was successfully cured. Furthermore, the name of Tamba and Elingang is known by Tamblingan. The existence of Tamblingan Village is also mentioned in the ancient inscription namely Prasasti Goblek Pura Batur A. The inscription mentioned about the era of Sang Ratu Sri Ugrasena, a king who ruled in Bali in 915-942 Masehi (837-864 Caka). Prasasti Goblek Pura Batur A and several other inscriptions associated with the reign of King Ugrasena uses the language of Ancient Bali and begins with the words "Yumu Pakatahu" which means "Let it be known by you all" or "You all should know (that)..,". Then ends with the mention of this place in the issuing of these inscriptions are "Panglapuan Singhamandawa" which mean " Governance Advisory Board in Singhamandawa (Badan Penasehat Pemerintahan di Singhamandawa)". Some sources explain that this inscription related to the management levies of the holy temple and arrangements of inheritance assets for residents who drop descent. Then it used to repair the holy sites. Tamblingan village has gained the attention of the authorities at that time. There is also ancient relic, "Lingga and Yoni" stored in Pura Dalem Tamblingan. The tradition in Tamblingan Lake has been evolved through a long process which start from the era of Ancient Bali and Bali Aga continued into the reign of Bali Kadiri up to the era of Bali Majapahit. Of course, it takes wisdom in preserving the richness of tradition and culture in Tamblingan. Hopefully helpful and thank you!